Adjust the toaster oven cooking rack to the middle position and preheat to 350°F. Grease a 6-cup muffin pan with cooking spray or oil. Slice ends off the zucchini and grate using a box grater. Gather shredded zucchini in a clean kitchen towel and twist to squeeze out excess water. You should have around 1 cup of shredded zucchini. In a large bowl, whisk together the cornmeal, flour, sugar, baking powder, baking soda and salt. Stir in the egg, milk, yogurt and butter. Add the zucchini and corn kernels, stir just until combined. 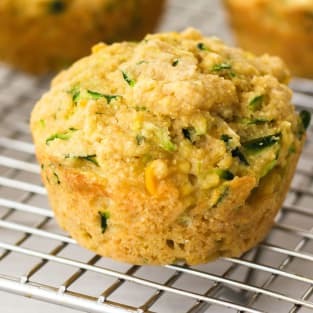 Divide batter evenly among cups in the prepared muffin pan. Bake muffins until a toothpick inserted in the center comes out clean, about 14 to 15 minutes. Allow muffins to cool in the pan for 2 to 3 minutes. Remove from pan and serve warm with salted butter and strawberry preserves. For cornbread muffins with a heartier crumb omit the yogurt.